I can almost see your eyes glazing over, so let's go back again to the example we have been using in this section. I am going to assume we are looking at the whole AS as a whole in basic topology, for simplicity. In Table 124, I have repeated the LSDB for this AS, and I have taken the liberty of replacing the [s with cost metrics; these are shown in Figure 181 as well. Again, remember there is no cost to reach a router from a network, so those links have a non-zero cost only going from the router to the network. This is the same sample AS that is shown in Figure 179, but with costs assigned to each of the links between routers and networks. Costs between routers and networks are applied only in the direction from the router to the network. 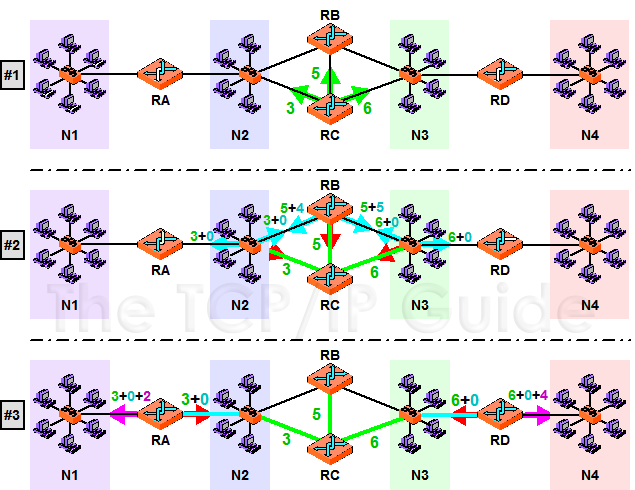 This diagram shows graphically how a router, in this case RC, determines the best path to various networks. The arrows here represent not the transfer of data but rather the examination of various links from a router to other routers or networks. In panel #1, RC examines its LSDB and determines the cost for each of its directly-linked devices. In #2, the second level of the SPF tree is constructed by adding to those numbers the costs of all routers/networks that connect to the routers/networks found in panel #1. (The red arrows represent looking back in the direction we came from in the prior step, which we dont pursue.) In #3 the process continues, resulting in the determination of a cost of 5 for RC to reach N1 and 10 to reach N4. RB, with a cost of 5. N2, with a cost of 3. N3, with a cost of 6.